François Rigolot (Ph.D., U. of Wisconsin), Meredith Howland Pyne Professor of French Literature at Princeton, former Chair of the Department of Romance Languages and Literatures (1984-91, 1996-99), of French and Italian (2002-03), and former chair of Renaissance Studies at Princeton (1993-2004). He is an authority on stylistics and poetics, and on the literature of the Renaissance. His books include Les Langages de Rabelais, 1972 (new edition, 1996); Poétique et onomastique, 1977; Le Texte de la Renaissance, 1983, for which he received the Gilbert Chinard Prize; an edition of the complete works of Louise Labé, 1986; a study of Ovid's influence on Montaigne, Les Métamorphoses de Montaigne, 1988. Rigolot was one of the contributors, along with T. Todorov, J. Cohen, W. Empson, and G. Hartman to Sémantique de la poésie, published by Editions du Seuil in 1980. His critical edition of Montaigne's Journal de voyage, based on a newly discovered manuscript, was published by the Presses Universitaires de France in 1992. As co-editor of A New History of French Literature (Harvard University Press, 1989) he was awarded the James Russell Lowell Prize by the Modern Language Association of America in 1990. The French version of the Harvard History was published as De la Littérature française by Editions Bordas in 1993. In his Louise Labé Lyonnaise ou la Renaissance au féminin (Paris: Champion, 1997), he addressed the problems of a middle-class woman writer in the age of humanism. His book on the concept of "error" before Descartes ( L’Erreur de la Renaissance) was published by Editions Champion, and his Poésie et Renaissance by Editions du Seuil, both in 2002. His critical edition of Sainte-Beuve’sCauseries sur Montaigne was published by Éditions Champion in 2004. He has served on the Editorial Board of PMLA and on the National Advisory Committee of the Institute for Renaissance Studies. He is currently directing dissertations on several early modern literary and cultural topics. He has taught Seminars for College Teachers, sponsored by the National Endowment for the Humanities (1981, 1984, 1986, 1988, and 1990). During the summers of 1989, 1995, 1998 and 2002 he taught at the Institut d'Etudes Françaises in Avignon. In 1987 he was awarded the Palmes Académiques by the French Government in recognition of his teaching and scholarship. In 1994 he was promoted to officier in that Order. In 1992 he received the Medal of the City of Bordeaux for his research on Michel de Montaigne, and the Medal of the City of Tours for his work on Renaissance literature. 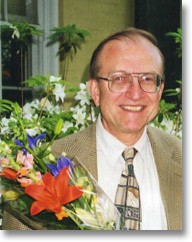 In 1993 he was presented the Howard T. Behrman Award for Distinguished Achievement in the Humanities at Princeton. He was knighted into the Ordre National du Mérite by President Jacques Chirac in 2002.